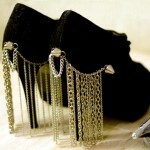 Fashion Infusion has a great tutorial for gussying up a pair of plain shoes with chains and studs. I love this kind of DIY embellishment: It’s fairly simple, but the result is really stunning and looks like it took far more effort than it really did. Check out some of the blog’s other DIY ideas too: I’m especially fond of these fingernail gloves and these decorated tights. There aren’t any instructions for those two, but they’re wonderful inspiration nonetheless.